NEW YORK, N.Y. - Pete Sampras defeated Andre Agassi and Ivan Lendl was a winner over John McEnroe after the native New Yorker unfortunately had to retire due to an ankle injury but as a whole, the real winners of the evening were the game of tennis and the fans as four legends came together at Madison Square Garden on Tennis Night in America. The four tennis legends took the court at the Garden for the first nationally televised professional matches on a court with 60-foot blended lines, for 10 and Under Tennis, on a 78-foot regulation court, showcasing both the best of the history of professional tennis and tennis for kids and future stars. It was an evening that evoked a lot of nostalgia for both players and the fans as the rivalries of the 1980s and 1990s were renewed in front of a near-sellout crowd of 17,165. During the evening’s final best-of-three set match that Sampras won over Agassi 6-3, 7-5, highlights of the pair’s career meetings played on the video screens overhead, including the classic 2001 US Open quarterfinal that Sampras won in four tiebreakers. "It is a little different day and age. Tonight was about creating a little nostalgia," Agassi, 40, said. "1989 was the last time I was here at Madison Square Garden. When people ask me what I miss about the game, I simply say New York. "I had three goals tonight," he added. "To stay healthy was my first goal and my second goal was to at least break Pete once. The third and most important was to come back to people I love and say hello." He did accomplish all three goals despite losing to Sampras, who dominated the first set of their meeting with his huge serve, which he estimated were probably hitting about 130 mph on the fast hardcourt. Sampras used his classic serve-and-volley style and never faced a break point in the first set but in the second after he took a 2-1 lead when Agassi double faulted, Agassi then earned his first break of the match in the next game with a passing shot to bring it to 2-all. The set progressed on serve then until Agassi gave Sampras two break points in the eleventh game when he hit a forehand into the net. Sampras then scored the break on the next point when Agassi hit a shot past the baseline for a 6-5 advantage and closed it out from there. He echoed Agassi’s sentiments on playing in New York and at Madison Square Garden, where he last played in 2008 against Roger Federer. "It was good tennis tonight, I thought we played pretty well for some old guys," Sampras, 39, said. "I had a lot of good times here in New York. It was a great night to play in front of 17,000 New Yorkers. I had a great time and I certainly hope to come back. "We wanted to put on a good show. I felt the level of tennis was quite high and the people enjoyed it," he added. In the first match of the evening, McEnroe, 52, had planned to break out his short-shorts from the 1980s that he was wearing underneath his longer shorts at some point during his match with Lendl, 50. However, he had to break them out a little earlier than planned. It was during his on-court press conference after he had to retire while leading 6-3 in the eight-game pro set match due to an ankle injury he sustained in practice. As McEnroe talked on-court to his younger brother Patrick McEnroe, a broadcaster for ESPN, he expressed his sincere disappointment at having to retire from a match he was looking forward to so much in his hometown and at the Garden, a place he comes so often. And then he dropped his shorts to reveal the tight short-shorts he wore while competing in the 1980s to loud cheers from the capacity crowd. "This meant so much to me to come play here," McEnroe said. "I was so psyched; I was hitting the ball clean in practice with Pete (Sampras). I tried to do everything I could to get ready. I am so bummed right now but at least I showed you I can still fit into my shorts circa 1985." "I have no idea why it happened," he added of the injury. "It was the end of practice, I was warm. I was hitting the ball good. Anyone who knows me knows how much it meant to me to play here. I was feeling ready. I was hitting the ball pretty clean. It is nice to feel you can go out there and still do it sometimes (at an older age)." As the match progressed, Lendl’s play picked up and he sympathized with McEnroe’s injury, knowing how hard it is to play when you are not at your best. "It is unfortunate John was hurt," Lendl said. "When he got his racquet on it, he was putting it away." "It was great to play here again," he added of Madison Square Garden and echoing the sentiments of all four players that evening. "I just hope it is not another 20 years before we play on this court." For the first time ever on television, Tennis Night in America featured professional matches with 60-foot blended lines for 10 and Under Tennis, on a 78-foot regulation court - showcasing both the best of the history of professional tennis and tennis for kids and future stars. 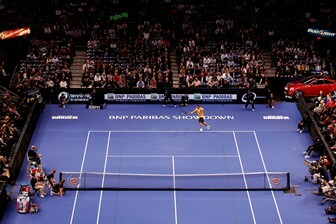 Here's Andre Agassi serving during the BNP Paribas Showdown to show the revamped court in action.